Why Chia Seeds are considered the latest super food. I love chia seeds and eat them as part of a healthy breakfast practically every morning. They are nutritious, filling and offer a boost of extra energy all which helps any weight loss regime. Not only that but they are a great way to keep regular and avoid constipation. It seems kind of funny that chia has somehow become an overnight sensation even though they have been around for centuries and I mean centuries. 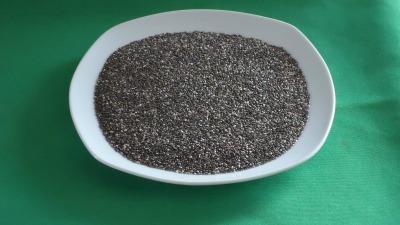 In fact chia seeds were first used by the Aztecs as early as 3500 B.C. These seeds are a member of the mint family and are native to central and southern Mexico and Guatemala and have always played a major role in the people's every day diet and culture. Through all these centuries these little seeds have been used in many ways. They were pressed to make oil, were added to water to make a healthy beverage, were ground to make versatile flour, added to foods and also included in medical treatments. Today chia is grown in Mexico, Guatemala, Peru, Bolivia Australia, Argentina and other areas that have the right climate are hopping on board to grow this amazing super food. 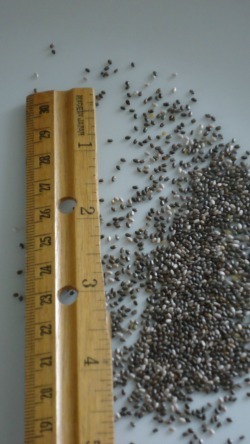 Though these seeds are super small they carry a super big nutritional punch. What a simple way to increase nutrition and help with weight loss. There is no preparation involved at all. Just by purchasing chia seeds you can add them to all kinds of dishes, no cooking required. Try sprinkling a spoonful on a salad or pasta dish. How about adding them to smoothies, yogurt or hot or cold cereals? You can get even more creative and try adding them to your children’s dessert such as in a pudding cup. What a great way to get kids eating healthy. To save a great deal of money I make my own holy crap cereal. What is Holy Crap Cereal?